Today I'm sharing with you this Friday finish!! and the pattern is also an OLDIE but goodie! JUST simple ones like this. Quilting comes much more naturally to me! I like the IDEA of making clothes.. I'm disappointed with the outcome! I also had some success in the kitchen this week. Two "new to me" recipes. The first is a Navajo taco. and stopping for this regional dish! but it SURE WAS good!!! after seeing a post on instagram. the BEST I've ever eaten. and letting it cool before getting all the ingredients together. THAT is the secret to GREAT cookies, I guess! I am finding new recipes constantly on pinterest and try some of them out. I still have my favorites though that I make every year although some I know longer make when I find new favorites. oooo! Thanks for the link for the cookies, they do look tasty. And the dress, so cute! I'm sure your little someone will look adorable in it! 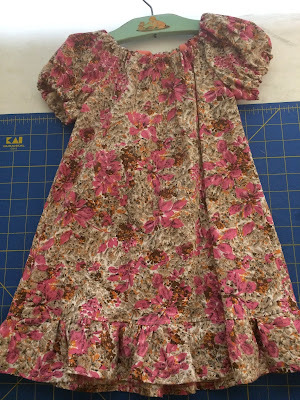 Love the little dress - I am not fond of sewing clothes either and I use to do a lot of it in my teens. Thank you for the links to the 'healthy' food. I love the fabric you used on the cute dress, Beth. That turned out so well. Oh, I do hope that someday soon you can snap a picture of your cute little girl in her pretty new dress!!! Soon she'll out grow it but you'll keep the wonderful memory. Those cookies sounds scrumptious, thanks for the tip. A little sewing, a little baking- must be the holidays! The dress is so cute. I just watched an episode of Hidden Heritage on RFDTV that featured a woman showing how to make the Navajo Taco- she sells a fry bread mix. Looks yummy. You had me at "butter" ....Enjoy the cookies. A very cute little dress. I used to make a lot of clothing, but college put a stop to that. Quilting is much more relaxing. oh! Fry bread! I remember eating Navajo tacos when I was student teaching at a Native Am school. Would love to eat one again - guess I'll have to make them!